In tests with high load, if a large amount of print jobs in quick succession respectively arriving parallel from several programs at or users in the print spooler of eDocPrintPro, we realized that it can sometimes happen that events are lost. Thus, for example, at 1000 Press Jobs some documents “lost”. In and of itself the problem was not noticed previously because normally must be made a sequence control via the eDocPrintPro SDK. Here, a print job should be started only when an event for the completion of PDFs sent by the previous job. However, there are also area of application where it is not possible to integrate a sequence control over programming in the application, and therefore the application generates many individual jobs respectively pages in quick succession. The following application should, however, realize all single jobs and process them without the printed application can be controlled, as no program-controlled intervention in the printing application is possible to synchronize the pressure with the further processing of PDFs. With version 3.23.0 which now works reliably even in the parallel multithreaded processing of print jobs 100%. Even at high load and at a large number of PrintJobs that are processed through the print queue no events and no documents are lost. For reasons of the memory usage, the number of parallel threads should not be too high. In our SDK example, we have this number is limited to 50. The SDK Version 3.23.0 also includes a C # sample project “Multithreaded Batch Printing demo” incl. Source code to show how this can be applied in your own applications, and enables this feature to test. 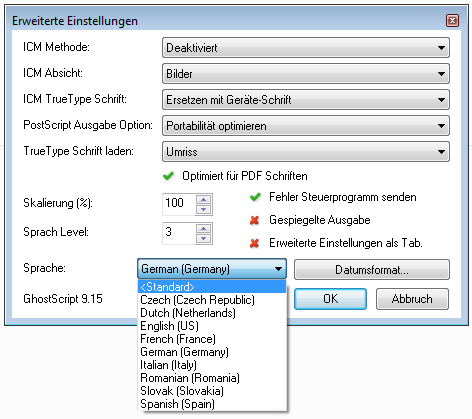 Czech and Slovak – available as new languages for the user interface eDocPrintPro. Languages are automatically set on the language of the operating system, but can also be selected manually.